A list of both active, inactive and dead projects. Unless noted in the item listing itself, there is NOTHING to download here. 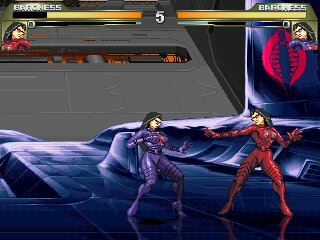 This is a remake of Rolento's Final Fight stage that uses parts from the actual Final Fight stage along with Street Fighter Alpha elements and stuff done from scratch. It will be in scale with Street Fighter Alpha sized characters. 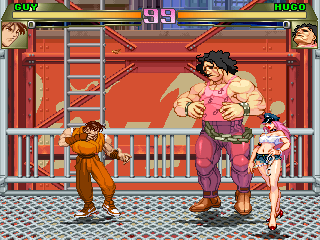 I remade a sign from Final Fight's last round for use as large billboards but I plan to replace them more interesting ones. El Gado and Hollywood will make an appearance. Tribute to Nintendo's 'Pro-Wrestling' for the NES. 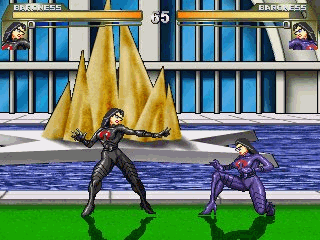 This is what I was ripping ring parts for back when I did that graphic rip pack of Capcom's Slammasters games. 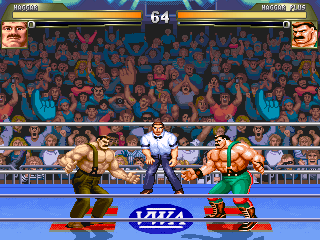 So far, edited the ring, referee and announcers to look like Nintendo's game. Will have a few different modes and appearances from the NES game's characters like Hayabusa, Starman, and the Amazon. Hall of Justice from the Superfriends cartoon (unfinished). 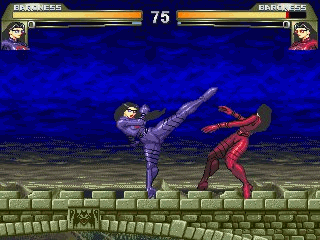 After getting my computer ALMOST back to normal and returning to check out what happened in the MUGEN world while I wasn't looking, I saw a screenshot were someone was making a Hall of Justice stage. So I put the project to a halt. 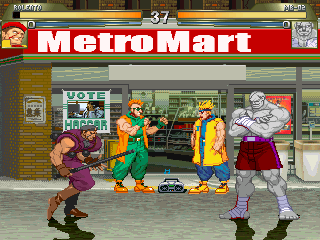 This used to be available on MugenBoss until 2004 or so when I found out that there was a real place named MetroMart. I planned to redo this stage but many other custom stages have re-used the SFA street as a base now. I'm not sure if I'll pick this project up again but I'll have to makea lot of changes to the outer store to make it look unique now. BTW: those ugly, older Mad Gear edits in the Sprite Edits area were made just for this stage. Currently an inactive project. the story behind this one is just a bit too long to try and explain in a short blurb. Click on the solo page link to read the whole story. All characters, settings and concepts © their respective owners. No rights to them are claimed here. Remember that these are free examples of fan works and not for use in commercial ventures. Final Fight, Street Fighter, Captain Commando, Battle Circuit and all related characters © Capcom. Streets of Rage, Shinobi, Golden Axe, Altered Beast and all related characters © Sega. Rushing Beat, Brawl Brothers and all related characters © Jaleco. Kirby and all related characters © Nintendo/HAL.All G.I.JOE, Cobra and Transformer related characters and concepts © Hasbro.